This no bake recipe is so easy and fun. Every year, I look forward to the holidays because I know I'll be making these yummy peanut butter balls with my niece and nephew. If you're teaching young children how to make sweets, you can't go wrong with this recipe since it contains only 5 ingredients, can be mixed together in minutes and doesn't require an oven! This recipe is very versatile too. It calls for dried fruit, so you can substitute your favorites. One thing I like to do is to divide up the mixture into smaller bowls and then let my niece and nephew add their own - this way everyone gets to make what they like the best. I hope you enjoy these holiday no bake cookies as much as we do! In a large mixing bowl, combine peanut butter, honey, oats, and fruit and mix well with a large wooden spoon. Shape mixture into 1-inch balls. 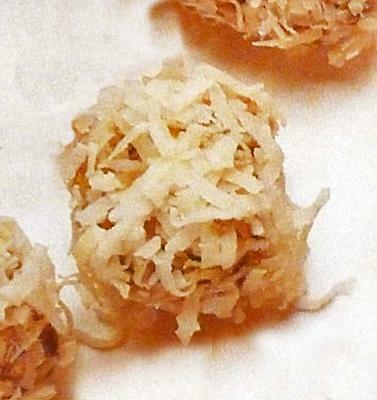 Place shredded coconut in a shallow dish and roll the balls in the coconut until thoroughly coated. Can serve these immediately or chill in the refrigerator. Be sure to store peanut butter cookie balls between layers of waxed paper in a tightly covered container. This recipe makes about 4 dozen Coconut Covered Peanut Butter Balls.